This will also work if you are still on ESXi 5.0 or 5.1. 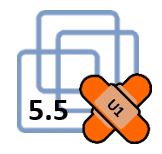 For more detailed instructions and useful hints regarding ESXi 5.5 please read my post How to update your standalone host to ESXi 5.5 - beware of missing drivers and do NOT upgrade virtual hardware! You mean to DISable the firewall again? Yes, maybe, but I do not consider this a big security risk, because it opens the firewall for outgoing traffic only. Thanks for sharing additional instructions, James! On https://my.vmware.com/group/vmware/patch I go to the Knowledge Base Article (KB) of the latest patch and at the end of it is the latest standard profile mentioned. correct, but a faster way to find out about latest ESXi patches and Imageprofile names is via http://esxi-patches.v-front.de. You should always mention that link when posting about updating ESXi. yes, but keep in mind that this will only work if your host has direct Internet access (not always the case) and the Imageprofile is available in the VMware Online Depot (for the ESXi 6.0 GA Imageprofile this is not yet the case).